Codling moth (CM) -- 1st generation, first sustained trap catch biofix date: May 16, Saturday. Codling moth development as of May 28: 1st adult emergence at 10% and 1st generation egg hatch at 0%. In most orchards, insecticide targetted against plum curculio and apple maggot prevent codling moth damage. If targetted codling moth control is needed, key management dates are shown here: 1st generation 3% CM egg hatch: June 14, Saturday = target date for first spray where multiple sprays needed to control 1st generation CM. 1st generation 20% CM egg hatch: June 21, Sunday = target date where one spray needed to control 1st generation CM. Obliquebanded leafroller (OBLR) -- 1st generation OBLR flight begins around: June 7, Sunday. Oriental fruit moth (OFM) -- 1st generation OFM flight starts: May 5, Tuesday; 1st generation 55% egg hatch and first treatment date, if needed: May 26, Tuesday. 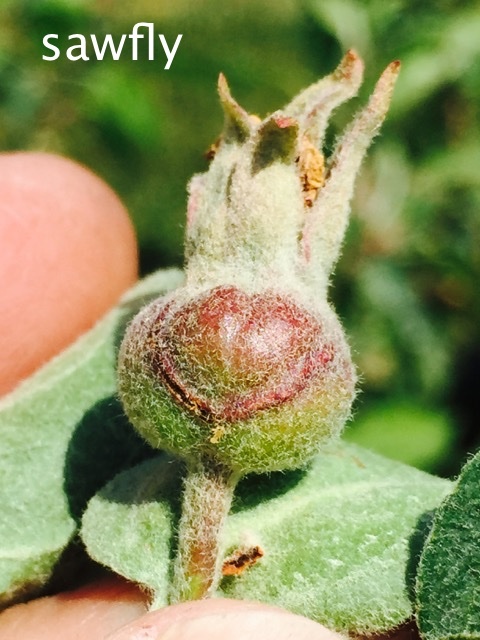 Plum curculio (PC) -- Increase risk of PC damage as McIntosh and similar cultivars increase fruit size: May 22, Friday; Earliest safe date for last PC insecticide spray: May 28, Thursday. San Jose scale (SJS) -- First adult SJS caught on trap: May 20, Wednesday; 1st generation SJS crawlers appear: June 18, Thursday. Spotted tentiform leafminer (STLM) -- 1st STLM flight, peak trap catch: May 13, Wednesday. 1st generation sapfeeding mines start showing: May 20, Wednesday. Optimum sample date is around Friday, May 22, when a larger portion of the mines are visible. 10-June, 2015 (Wednesday) Mass. Fruit Growers' Assoc. in cooperation with Essex County (MA) Fruit Growers, UNH Cooperative Extension,and UMass Extension Fruit Twilight Meeting. Parlee Farms, 95 Farwell Rd, Tyngsboro, MA. 5:30 PM.Pizza for a light supper. 1 pesticide re-certification credit. Special guest: Tom Callahan, Adams County Nursery will talk apple and peach varieties, horticulture, rootstocks, etc. Alan Eaton, UNH Cooperative Extension will discuss current pest status. 18-June, 2015 (Thursday) Fruit Twilight Meeting in cooperation with Rhode Island Fruit Growers' Assoc. Rocky Brook Orchard, 997 Wapping Rd, Middletown, RI. 5:30 PM. Bring lawn chair for yourself as there will be an outside picnic light supper. Pesticide re-certification credit(s) will be available. Special guest: George Hamilton, UNH Cooperative Extension will discuss targeted orchard spray application and demonstrate what you can do to improve your airblast spray pattern for improved pest control and pesticide efficiency. "European apple sawfly (EAS) does not wait around too long after petal fall to start damaging fruit. This is characteristic EAS half-moon scar damage on very small apple fruit. See picture. Usually just a nuisance, however, if your orchard has more than acceptable amount of EAS damage, a pink insecticide (Danitol or similar pyrethroid) or immediately at petal fall (Imidan). The former is preferred. Removal of wild host trees in the area will help keep EAS numbers down." 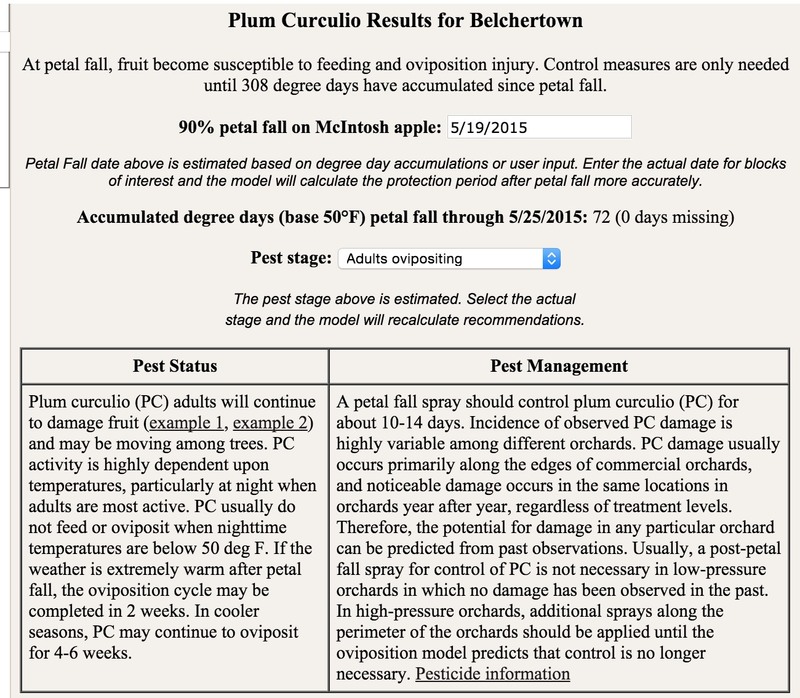 "Plum curculio will be very active this week given the weather forecast of showers/thunderstorms late in the day. Expect a big push of PC into the orchard when the first warm, wet evening arrives. Pesticide options are many, however, a good dose of Imidan (2-1/2 to 5 lb. per acre depending on tree size) is still the gold standard for controlling this pest. Expect about a week of activity from time of application, then re-treating may be necessary. See NEWA screen shot below for more information." 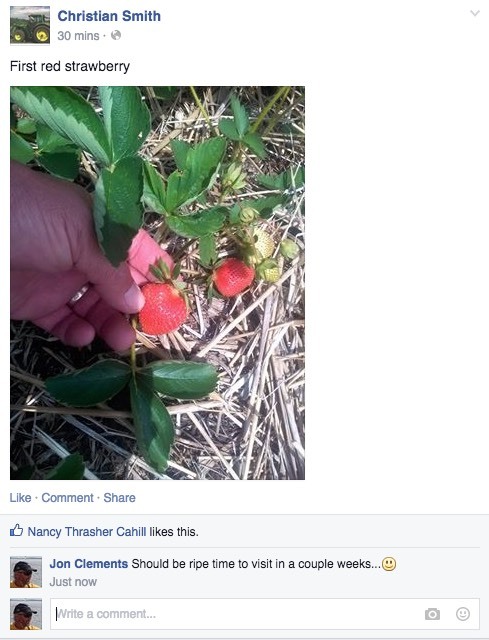 With the patchy rain, some growers may have had heavy infection periods while others did not. There are a few factors to consider. First, were leaves wet long enough for an apple scab infection period? If the temperature averages 60 to 75 degrees when leaves are wet, 6 hours is enough time for an infection. If it rains at night, the infection period doesn’t start until daylight, about 6 AM. Second, apple leaves are getting tougher. That is, they are somewhat more resistant to scab infections. As the season goes on, apple tissue becomes increasingly scab resistant. Third, in a typical year, the amount of inoculum would be very small by now. It would have matured and been released in a series of wetting periods. By fruit set, almost all the primary inoculum, ascospores, are gone. If there are no infections in an orchard, there’s no need to spray for scab. The graph below shows how risk of apple scab infection rises and falls in a typical year (The growth stages at the top are GT = green tip; HIG = half-inch green; TC = tight cluster; P = pink; B = bloom; and PF = petal fall. From an article by Falk, S., Gadoury, D.M, and Seem, R.C. 2002.). But this isn’t a typical year. There appears to be much more inoculum present than we generally see at petal fall and fruit set. Our laboratory tests continue to show large numbers of mature ascospores still available in old leaves. Yet at the same time, NEWA and SkyBit indicate that 97% to 99% of ascospores have matured or been released. Why the difference between the scab models and the lab tests? Basically, it’s the dry weather. When it’s dry, and old apple leaves on the ground dry out, two things happen. Ascospores stop developing, and they aren’t released. When the leaves get wet after being dry, they do release spores, and spores start maturing again. We only have a general idea of what this means for scab risk after petal fall. We do know that there are many more ascospores than usual, more than NEWA and SkyBit are indicating. Not only do our direct observations tell us that, but two models, RIMpro and Ag-Radar, estimate only 35% to 73% of this years ascospores have matured and been released. The bottom line – a tenth of an inch of rain or more is enough to release these spores, and we believe there are a lot of spores available. If it rains long enough to keep leaves wet for 6 hours or more, there will be a scab infection. One of the best things that can happen at this point would be for a short, heavy shower to release a large part of the remaining spores, but leaves dry relatively quickly and there is no infection. That has happened once at Cold Spring Orchard this year, and may happen again. But to be safe, given the scattered showers, probably the best strategy is to spray a low rate of mancozeb or captan with insecticides for protection. In addition, keep a post-infection fungicide ready in case you go a week or more between fungicides, and need to treat after a rain. As we said last week, consult the New England Tree Fruit Management Guide, Chapter 6, Disease Management for a table listing “after-infection activity”. The good news is that by the end of next week, around June 6, all of the ascospores should have matured in most parts of Massachusetts. At that point, a decent rain will release them, and with any luck we will be done with this strange scab year. With severe thunderstorm warnings in many parts of Massachusetts, be ready to deal with trauma blight. 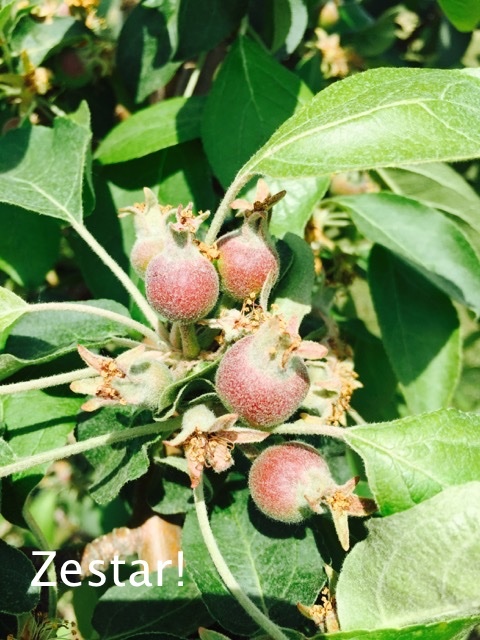 If hailstorms develop, and hit an apple or pear orchard, there’s a high risk of fire blight. The risk is presently extreme according to both CougarBlight and MaryBlyt. There’s no doubt this is blight weather. Growers should be ready to apply streptomycin within 24 hours of a hailstorm or severe winds in a thunderstorm. The damage from these storms open apple tissue to invasion by fire blight bacteria. To stop serious damage, apply streptomycin as soon as possible after the storm ends. "Don't let newly planted trees stay in bloom as the risk of fire blight is very high this week. (Assuming we have wetting.) This includes any bloom. (Cider varieties?) 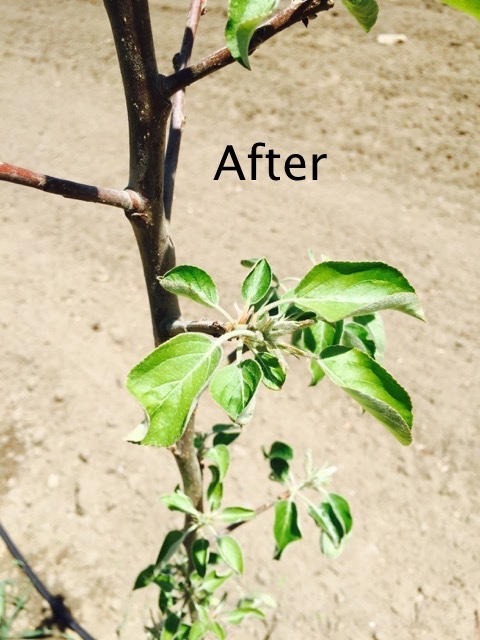 Cut or pick off (only during dry weather) any bloom on newly planted trees, as this is a huge risk for fire blight. See before and after pictures. In addition, avoid any pinching/cutting/pruning of trees this week as the risk of getting fire blight is very high. (Heat and predicted wetting.) I am optimistic we are going to get through this year with zero-tolerance for fire blight, which has been certainly helped by the dry weather." 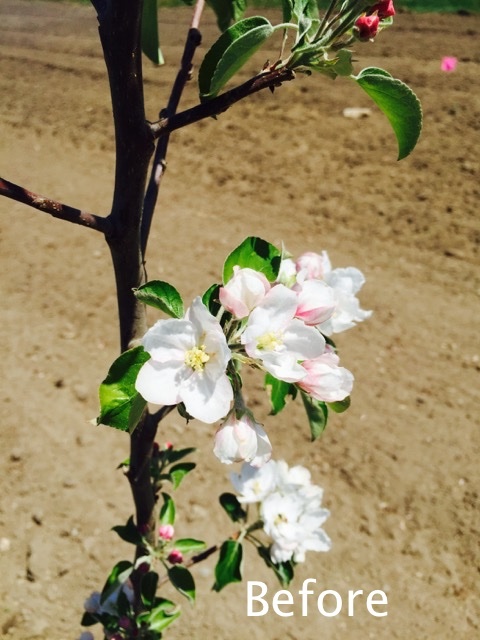 "This will be a good week to get some apple fruitlet thinning done given the warm temperatures (day and night). If you need to thin aggressively -- and see below for picture of Zestar! fruitlets -- then this is your week. Alternately, be aware that thinners ought to work very good this week. In order from weak thinner to strong thinner, your choices include carbaryl (Sevin), 6-BA (Maxcel and similar), and NAA (Fruitone-L, Pomaxa). Any combination of the above could be synergistic -- adjust your rate (downward) accordingly. Although we might have over-thinning this week (but I doubt it) given the weather forecast (which may change daily), we rarely over-thin so get out there and put some thinner on this week to reduce the crop load. Good rates of carbaryl would be 1 to 2 pint per acre (depending on tree size), Maxcel 48 to 64 ounces per 100 gallons dilute TRV, and NAA 2 to 4 oz. per 100 gallons dilute TRV. "Note that Zestar! (pictured) is generally considered pretty easy to thin, however, at this stage (1- to 15 mm) you want 2-3 oz. per 100 gallons dilute TRV Fruitone or Pomaxa plus 1 to 2 pt. carbaryl per acre (depending on tree size) to do the job." "Chemical apple fruitlet thinners will work very well this week given the NEWA Apple Carbohydrate Thinning Model. Note it suggests you decrease your chemical thinner rate by about 15% if applying today or tomorrow. See below. This is a good opportunity to thin if you need to get some thinning done. 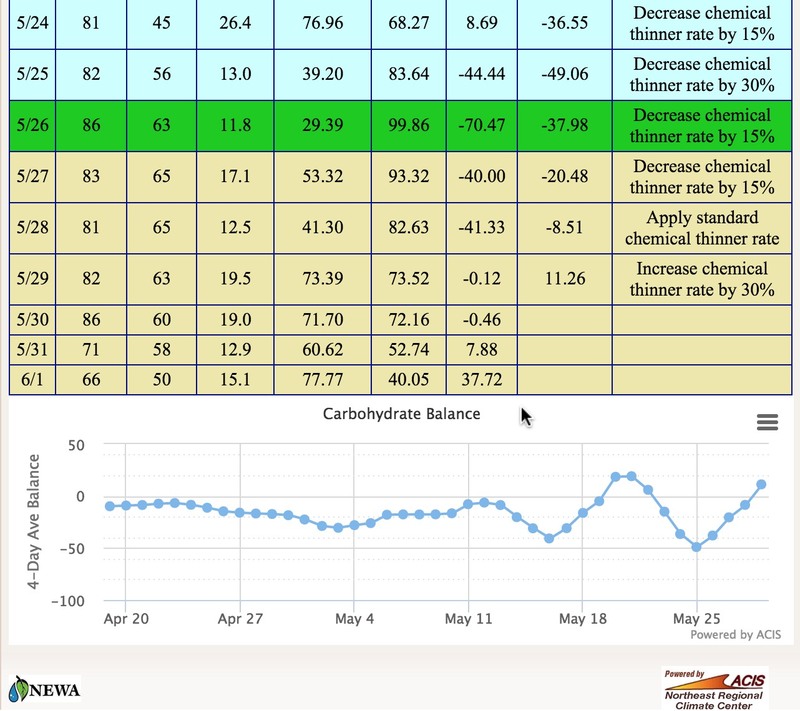 By the end of the week, the carbohydrate status is predicted to have a surplus, and then thinning will become more difficult. Now is your window. Let me know if any questions." The next Healthy Fruit will be published on Tuesday, June 2 or thereabouts, 2015. As always feel free to get in touch with any member of the UMass Fruit Team (http://extension.umass.edu/fruitadvisor/team-members) if you have questions or comments.